Kasper is committed to getting our passengers and their personal luggage to their destinations. Our terms and conditions are listed below, if you have any questions please contact us for help or clarification on our terms and conditions. If parcel exceeds weight restrictions and dimensions, (150lbs and 48” X 72”) – extra costs may apply. customer will be contacted by Kasper staff to accommodate larger sizes. ** Additional pieces will be treated as freight and will be subject to freight rates. Passengers and baggage or goods will be carried within space and weight limitations of the bus. 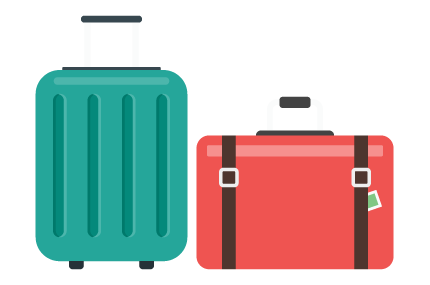 Baggage and/or goods which can not be carried within the space and weight limitations of the bus may be subject to additional charges, and may have to be sent on a next possible bus. The carrier shall use its best efforts to carry the passengers and baggage with reasonable dispatch. Times shown in charter contracts, passenger tickets or elsewhere are not guaranteed and form no part of the charter contract. Bus times are subject to change without notice but we will do our upmost best to advise our clients of updated times. If for some reason we haven’t contacted you, please feel free to give us a call for immediate assistance. (1) All baggage or goods presented for transportation is/are subject to inspection by the carrier. (2) Articles of baggage or goods will not be carried when such articles are likely to endanger the bus, persons or property, are unsuitably packed, or the carriage of which would violate any applicable Canadian laws, regulations, or orders. (a) Firearms of any description. Firearms for sport purposes will be carried as baggage provided the passenger possesses the required permit/licence and, provided that such firearms are disassembled or packed in a suitable case. The provisions of this subparagraph do not apply to Peace Officers’ prescribed sidearms or other similar weapons. The provisions of this subparagraph do not apply to Peace Officers’ prescribed side arms or other similar weapons. (b) Explosives, munitions, corrosives and articles which easily ignite. (c) (*) Pets including, dogs, cats and birds, when properly crated in leak-proof containers and accompanied by valid health certificates or other documents where these are required. Such pets and animals may be carried in the cargo compartment of the bus with prior arrangement with Kasper Mini-Bus customer service specialist. (*) Not applicable to service animals. (1) Tickets are non refundable, however a refund may be considered in extreme circumstances on a case by case basis. (2) Travel can be rescheduled with a minimum of 24 hrs notice prior to departure. Any change in schedule will be subject to a $30.00 rebooking fee. (1) * Subject to subsection (2), the liability of the busline in respect of loss, or damage to, baggage, whether caused directly or indirectly by the act, neglect or default of the carrier or not, is limited to the sum of $50.00 per passenger. * Not applicable to mobility aids – see Rule 7 (G). (2) No action shall be maintained for any loss, or partial loss of or damage to baggage or for any delay in the carriage thereof unless notice of a claim is presented in writing to the head office of the carrier within 30 days from the date the baggage should have been delivered. (3) The carrier will not pay loss or damage to negotiable instruments, money, securities, commercial papers, jewellery, precious stones, fine art or other items of extraordinary value. (4) The carrier will not pay for loss or damage arising from the breakage of clocks, china, glass, sculpture, or other items of a fragile nature, except in the event of an accident to the busline. "We're a small carrier that thinks differently."